This is a favorite recipe of our family....!!! In this recipe the chicken is cooked in hot hot spicy condiments in thick curry. This hot curry with a really mouthwatering taste combines excellent with rotis, chapathi, parathas, naan or white steamed rice. The fennel seeds, masala paste and fresh coriander enhances the flavor and aroma of this delicious spicy curry. Chicken with or without bones can be used for this. Here goes the recipe for quick and easy spicy hot chicken curry..Enjoy..! Marinate the chicken in marinade for 30 mins. Sauté further for 2 mins. Turn off flame, allow to cool. Add red chillies and fry. Add tomato and sauté for a min. Cover and cook until tomato is fully cooked. Mash the contents and add the masala paste. Add a cup of hot water and salt, mix well. Cover with lid and cook the chicken until it is done. 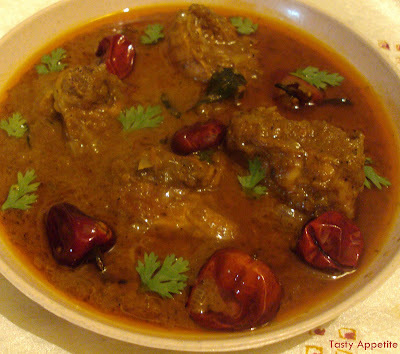 Stir well and keep in low flame until the curry attains the required thick consistency. Add a tbsp of lemon juice, combine well. Serve hot with rotis or white steamed rice. wowww lovely n fantastic curry dear!! Wow awesome recipe Jay. those round chillies look great in the gravy. as for Arusuvai received your comment and thanks for your interest dear. please send me your e mail is. that looks hot n yummy...drooling here..
Love the addition of sauf, I love adding sauf to curries and I'm sure this one is grt! Irresistible chicken curry..spicy and aromatic..love it. Surely would love to have this with rotis and rice...hot hot curry..
looks so delicious, nice click too! what r the chillies u have used for garnish called? I can see its spicy just by looking at it.:). Those milagais! 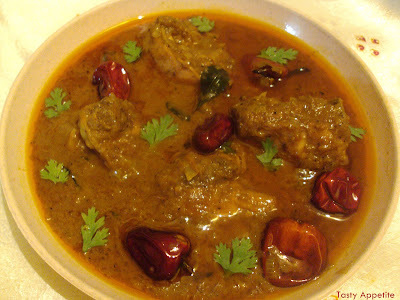 Very tempting and fingerlicking chicken curry..
Spicy chicken curry looks delicious. yum! I had curry tonight, but yours looks wayyyy better! 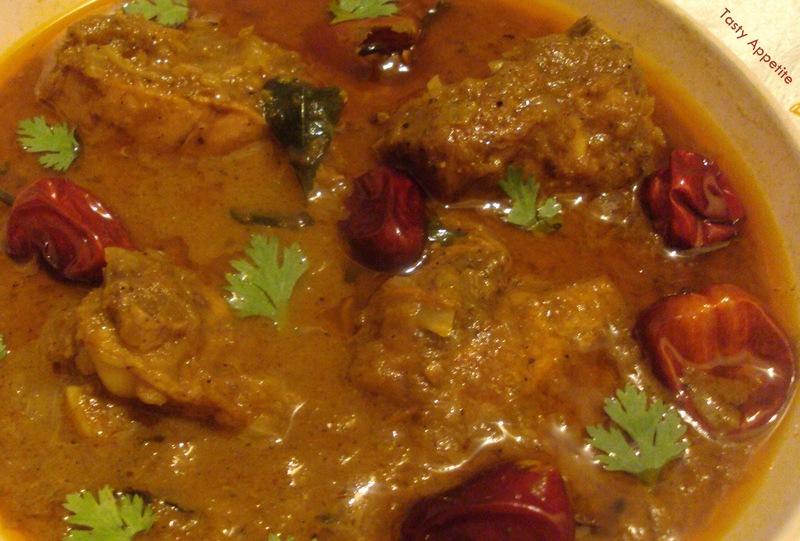 I love chicken curry and your version looks absolutely fiery and delicious! hello jay :) just had to leave a comment, seeing all those chillies!!! looks delish!! Hi Jay...just can't wait to try this dish....too good!!!! oh what a great curry! This is really my kind of curry...very very yum looking! Jay dear, u've a good surprise waiting for u in my blog..Check it out !!! Thanx for sharing your thoughts and dropping by..! I have used Red chillies that is round type for garnishing..
giv a try n enjoy and let me know too.. I modified my recipe after you! WOWOWOWOW I do love when tried and tested family favourite recipes are posted by respected food bloggers you know that they will be keepers and your chicken curry is just that a KEEPER is looks so tasty and simple! Superb work on this challenge. Yummy curry...just perfect with rice/chapati. Thks for dropping by at my blog. Simply mouthwatering curry! I wish I could have it now with a bowl of hot steamed rice!